It's no secret that our favorite place to Race-cation is Disneyworld. Actually, in less than 30 days, we'll be heading to Disneyland for our next race. 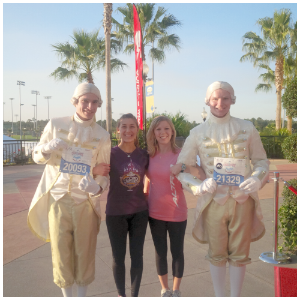 However, we know that running at Disney does not appeal to everyone. We've done a lot of other cool destination races other than Disney, and there are quite a few more that we would like to do. Afterall, Location is the number one thing we look for in a race. Is it someplace we like to go or want to visit? We like to visit destinations that offer other events, places to visit, or things to do other than just the race. If you like those things too, here are a few "Race-cations" you might want to take. 1. Virginia Beach: The rock n roll race at Virginia Beach is the perfect Race-cation. Not only can you get in some beach time, but the weekend of the half marathon is the same weekend as the Music Festival. This means if you are registered for any of the races that weekend, you get in for free. There are bigger named bands on the main stage on the beach all weekend, and then the headlining act on Saturday night after the races. There are smaller bands playing throughout the weekend too that are free for everyone to watch. that it is over Labor Day weekend and if you don't live near by, hotels can be very pricey during that time. 2. Las Vegas: It's Las Vegas so I don't think it needs any explanation. We did the Rock n Roll Marathon/Half marathon and 5k this past November, but there are actually some other races that go on in Vegas too. 3.Williamsburg, VA. We did the Run for the Dream race one year in June and I remember this being such a fabulous race (besides the heat). There was stuff going on all weekend. That race included free two day passes to Colonial Williamsburg, free transportation, Meal vouchers, free pass for Busch Gardens, and a Fireworks display. 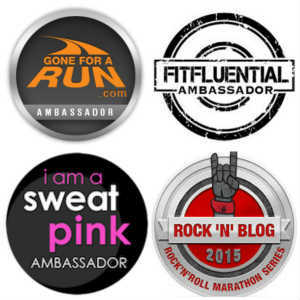 All runners got discounts at participating resorts. We stayed at the Woodlands and it was fabulous! I am anxious to do this race again someday! 4. 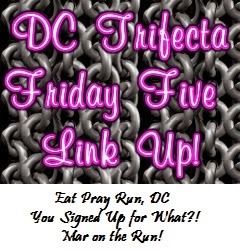 If you wanted to run the Nike Women's race and earn that Tiffany necklace, you sadly won't be able to do it in Washington D.C this year. Instead, the Nike race is moving to Toronto, Canada, and it is now a 15K. Before the race, take a few days to explore the city. Visit the CN Tower, the theatre district, the zoo, and do a little shopping. They have a very large mall there! This race is in June, the perfect time for a little vacay! 5. Want a Race-cation that may be a little more relaxing? How about trying one of those Wine Country races? The race itself may not be relaxing, but touring the vineyards and listening to good music at the festivals might be. There currently is a wine country race in Louden County Virginia, several in California, and in British Columbia. We are currently at the beach for the weekend preparing to run the April Fools race in Atlantic City. It's not quite a "race-cation", but it's one that we enjoy. The race is along the boardwalk and we finish on the ocean front. The location is great, lets just hope the weather turns out to be too! Where is your next "destination" race? I've only been to Virginia Beach once and loved it. It was in January and it was absolutely freezing but walks along the beach were quiet and perfect! Would love to go back there and race sometime. Oh, you must go back and visit in the summer! Even the fall is nice too! Santa Rosa sounds pretty! You need to get to a Disneyland race since you live so close! Vegas is on my list too! I've only run one night race and it was so much fun - and so much easier than getting up early! Ahh, we included a couple of the same races! Vegas has not be on my list, but I might like to try the Rock 'n Roll race there. My next destination race is Boston and then Tinkerbell! We will hopefully see you at Tinkerbell! I would love to do both VA Beach & Las Vegas some time. Have a fun weekend! Have a great race this weekend, ladies! I love your list. Running in Vegas would be incredible! Thanks Courtney! Yea, running in Vegas was pretty cool! My parents just went on a quick weekend trip to Toronto and they had a good time. Would be nice to visit the falls.. I haven't gone since I was 6 or 7. It's not an exotic destination, but I would love to do the MCM 10k one year. I haven't explored DC in years and there are more monuments since the last time I did explore. I'd also like to get lost in the Smithsonian, after the race of course. I would LOVE to do a wine country race; that sounds wonderful! Such a great list, thanks for sharing these ideas! I'm starting to get embarrassed that I've never made it to Vegas! Great ideas for places to add to my ever-growing list! My next destination race is Houston in January (OK, it's not that far from where we live, lol - but we still do it up big with staying at the host hotel, etc). Our future destination race is the Maui half...one of these years! My next official racecation is the NYCMarathon! but I will have 2 Disneyland races before then to hold me over. and runing the RnR LV is definitely on my list for next year! Besides disney, Beach destinations are our favorite! My next destination race is the Tinkerbell half. Cannot wait! Have a great weekend! I want to do races that are within a few hours driving - in Cincinnati & one in Nashville... I can't handle the idea of far distance runs ... I'm the worlds worst traveler. No doubt. We'll be running in Nashville later this month! I've never run a destination race but hope to one day. It's hard right now with my daughter being so young. Vegas sounds amazing but I certainly wouldn't mind earning a Tiffany's necklace either! I can't believe I've never run a race in Virginia, my former home! I need to change that. My next destination race is the Chicago Marathon this October. I cannot wait! RnR Virginia Beach and Las Vegas are on my "to run" race list as well as the Nike Women's. I don't currently have any thing planned for my next destination race, I am wanting to run Virginia Beach this year. You brought up a good point with the hotels, guess I need to figure out my plans and finalize soon! I loved my race in Vegas and the Nike half in DC. Great list! I'd like to get to VA beach one year. Bad weekend bc of school. My next race-cation is to Atlanta and I am already thinking about the next one! :) Enjoy the weekend! RnR Vegas is on my bucket list. I will do it one day! I would love to run the race in Williamsburg, you get so much stuff included in your registration! My next destination race is a half the first weekend in May in Ocean City, MD. Hmm my next destination race is hopefully the Army 10 Miler in the fall. Love DC! Wine destination race sounds good to me. I only have 2 races on my schedule over the next couple months... need to find another one. My next destination race is Castaway Cay :) and then I'll be in Virginia Beach for the RnR half! Atlantic City sounds like a great place for a race -- especially this time of year (not too hot and sunny)! I'm actually debating over one of the Wine Country half marathons now. Decisions, decisions. I don't know if I want to run RnR LV, but there is a Nurses Half Marathon in Nevada that sounds amazing. Corny, right? I don't know much about Toronto, but I think I'd love the chance to discover a new city, especially if it included a Tiffany's necklace. I totally wan to run for a Tiffany's necklace someday! I had hoped to get into the Nike Women's race this spring in DC and was so disappointed when they moved it! I ran the Virginia Wine Country Half the first three years they held it, and really enjoyed it (except for the consistent delayed starts). My son is running it this year and it will be his first half! 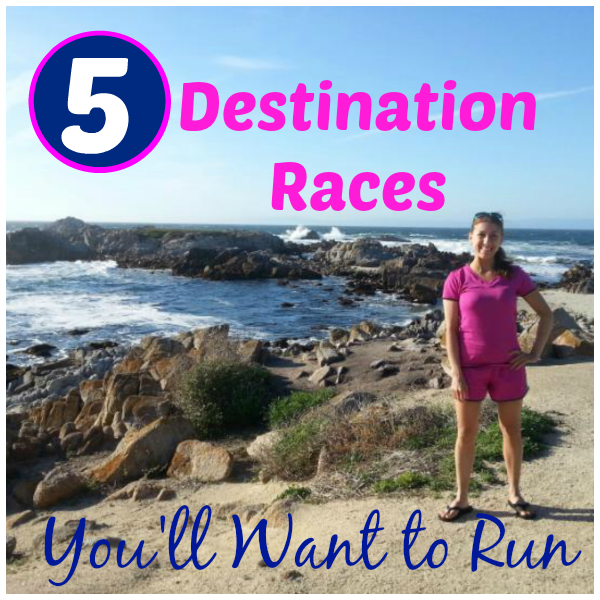 Our biggest destination race to date was the Big Sur Marathon in California! No destination races this year, but I did like running VA Beach. Have a great race weekend! They sound like great locations to me even though I have only been to 2 of them! Gotta love the destination race! Of course, Disney is my favorite, but it's awesome to be able to check out lots of different states for the sake of a race. Definitely one of my favorite aspects of being a runner! Destination races are fun! I visited Colonial Williamsburg years ago. It would be fun to run there and to visit again. Great list. I could go for all of them. In fact, many of them are on my short list of "to run", especially VA Beach, Williamsburg, and Vegas.